Angelina Jolie directs UNBROKEN, the tale of an average Olympic runner/American soldier, Louis Zamperini (1917-2014), who survives insurmountable odds to make it through World War II alive. Whereupon he resumes his average life. Right outa the gate, Jolie’s direction is marvelous! It’s dynamic and detailed, and she’s doing her mentors proud with this, her second directorial feature. It is most definitely the best feature of this movie, which suffers in other aspects, most notably, the story grinding to a skidding stop like a long-jumper in sand, during the third act when Zamperini is consigned to a prison camp and his misery just starts repeating itself until War’s end. Angelina Jolie takes a well-deserved rest on the shoulder of Louis Zamperini. Louis would sadly not live to see the film premiere, only a rough cut while in hospital. He died July 2014, aged 97. During a search mission, Zamperini’s bomber malfunctions and crashes in the Pacific, whereupon he struggles for survival onboard a life raft with two other crewmen for a record number of days (Gleeson and Finn Wittrock). Unintentionally funniest scene is the audacity of the three men “ambushing” and attacking the circling sharks, dragging one onboard and killing it to eat ravenously, to what must be the chagrin of the shark’s fellow predators. Rescued by a Japanese ship, Zamperini is thrown into a Japanese POW camp, featuring Garrett Hedlund as a US officer, and Miyavi as the sadistic camp commander Watanabe, who tortures only Zamperini incessantly because his screentime for being lauded as a War Hero is running short. The film’s first two segments (braving the dogfighting skies onboard the bomber and braving the elements onboard the raft) are its glories. When Zamperini is stranded in the POW camp, we’ve attained THE PASSION OF THE CHRIST. There is no more growth of the character, just unrelenting torture. At one point, Watanabe makes all the prisoners punch Zamperini, who takes hundreds of socks to the jaw, until they’re beating on him while he’s unconscious. Can any human sustain this battery without requiring surgery to mend the broken jaw? Unless all the men were holding back. But were they, with the commander shouting “Harder!” at each one? 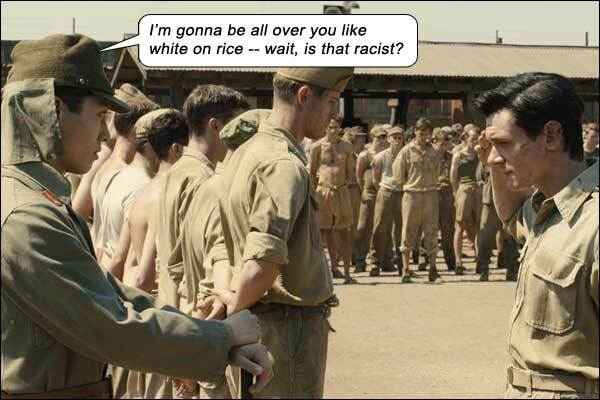 And there is that “triumphant” scene of Zamperini holding up a thick plank at Watanabe’s command. For no reason. It’s not done to prove any point, although it’s made to seem like he’s displaying his spirit, as he gives a yell after hours of holding it up and hoists it higher above his head, only to get beaten for it. Oh, good one! Then the war ends. Hooray. Uh. Wha–? Was Zamperini instrumental in ending the war? No. Was his resilience in any way connected with his Olympic training? No. Did his efforts get the commander transferred? No. Did his defiance get better treatment for his fellow prisoners? No. Did he even return to running after the war and win any awards? Uh… no. UNBROKEN finally becomes THE PURSUIT OF HAPPYNESS, by not allowing us to share in Zamperini’s ultimate joy or redemption, opting to show us title cards instead. The title cards openly tell us Zamperini battled PTSD after the war (well, who wouldn’t? ), which means he was at least a little bit broken. The titles also tell us he became a born-again evangelical (which means he was a LOT broken) and searched out his captors and forgave them in the name of Christ (except for Watanabe, who refused to meet him). There’s a movie right there, but Jolie chose to show the torture, not the forgiveness. But I’ve got a story for you. I was beaten to death in August 2014 by muggers. I was aware of the homeless plight of my two assailants; I understood how avaricious politicians created the wealth disparity that these muggers were the victims of, and I empathized on how the muggers might do anything to achieve living like human beings with dignity – including beating a man to death and stealing his car. (And here was where I learned that all it takes to break a human jaw is a few well-placed strikes, let alone hundreds of punches in a malnourished condition!) And I forgave my attackers. But here’s the clincher: I did it without believing in imaginary deities. Christ had NOTHING to do with it! I forgave them because it was the human thing to do. I forgave them deep down where it counts, where no “savior” had tainted my being with threats of fire if I didn’t. Did anyone call me a hero? No. Because I am not one. I merely survived an assault. And I’m not a hero for forgiving someone. I’m just a simple cucumber, trying to make my way in the universe. Respect to Louis Zamperini for being an athlete, but taking punishment – that’s not heroic, that’s saddening, tragic, inhumane, deplorable, illegal. Bouncing back from torture may be heroic, but is better described as resilience, not heroism. There’s something terribly damaged in this poor guy. He’ll never be the same. Skipping forward 50 years to show us the real life 80-year-old Zamperini carrying the Olympic Torch is a sad reminder this man’s best years were while he was being tortured! But surely they weren’t, which means the film is missing something big. Maybe the filmmakers could have dispensed with the platitudes and explored how war makes a person broken? Like everyone over 40 is broken in some way, spiritually, mentally, socially, sexually, psychologically, financially… calling a film about a broken person UNBROKEN is like calling the film about the defeated governor of Alaska UNDEFEATED. Writers: Joel Coen, Ethan Coen, Richard LaGravenese, William Nicholson,, Laura Hillenbrand. Starring: Jack O’Connell, Domhnall Gleeson, Garrett Hedlund, Miyavi, Finn Wittrock, Jai Courtney, Maddalena Ischiale, Vincenzo Amato, John Magaro, Luke Treadaway, Louis McIntosh, Ross Anderson, C.J. Valleroy.